Does it get more comforting than chicken and mushrooms in a cream sauce with noodles? I think not. Stocked with a bunch of leftover mushrooms from the Filet Mignon with Mushroom Sauce and a lot of heavy cream from the best ever Macaroni and Cheese, I decided to try out the Chicken Fricassee recipe in The Gourmet Cookbook. We really love creamy chicken dishes but most of them include cream of yuckiness soup. Although this recipe is not exactly low-cal, it is a delicious and creamy combination of chicken and mushrooms with no fake or processed ingredients. This dish is nothing fancy, it’s just good old-fashioned comfort food. The chicken was extremely tender after being braised in the chicken broth and vegetable mixture and the finished dish was perfect served over egg noodles. 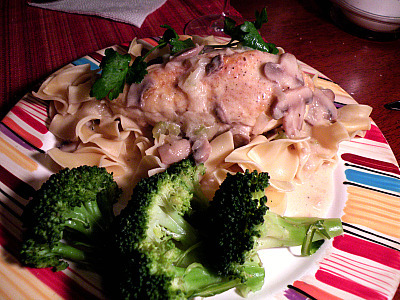 This was a great weeknight meal served with steamed broccoli and rolls alongside. And on another note…I promise the week after Thanksgiving I will attempt to focus more on recipes that qualify for the “Healthy” category! Generously coat chicken with salt and pepper. Heat a large, heavy skillet over medium-high heat. Add oil and heat until shimmering. Carefully place chicken in pan, skin side down and cook for about 3 minutes per side, until browned. Remove chicken from pan and reduce heat to medium. Add onion, celery, mushroom and garlic and cook for 7-10 minutes, or until mushrooms and onions have softened. Stir in thyme and flour and cook for another minute or so. Add in chicken broth and bring to a boil. Add chicken, skin side up, and simmer, covered, until chicken is just cooked through. This should take 20-25 minutes and internal temperature should be 160 degrees for breasts and 170 for legs or thighs. Transfer chicken to a plate while you make sauce. To make the sauce, whisk together cream and egg yolk in a small bowl. Add in 1/2 cup mushroom/broth mixture in a slow stream, whisking constantly. Whisk cream mixture into sauce in pan and gently simmer over low heat (careful not to let it come to a boil) whisking frequently. Sauce should slightly thicken and cook for about 1 minute. 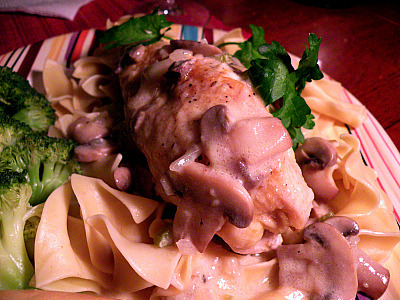 Place chicken over egg noodles and spoon sauce over. Sprinkle with parsley.